If you have this link in your wordpress admin menu then you have the promotions plugin activated. Click the “Add New” link under the Promotions Menu. Featured Image – This is more for aesthetic purposes and should not be an image with text on it (As it might get cutoff when cropped). Promotional Addons – Extra functionality can be added to your promotion, ie make it printable, add a subtitle, etc. Promotions might already be incorporated into your site, i.e. a slider on your homepage, or already built into your service specials page, but if not, you can output them easily by entering this shortcode on any page. Title, featured image, a small content excerpt, details page link, are all shown here. These are also refereed to as teasers. format has two options, list or slider. List will output like the below picture. List allows for the promotional addons Print & Share. Type has four options, service, parts, vehicle and all (service & parts can be grouped together, using type = service,parts. Whatever type is selected is the kind of promotion that will be displayed. 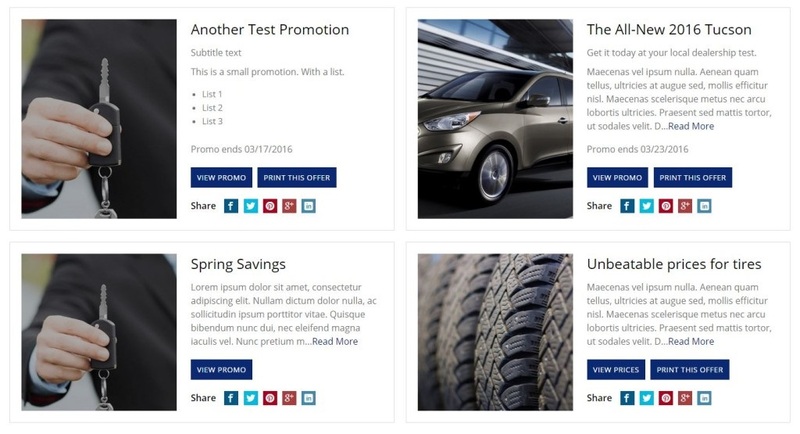 The vehicle type promotion is displayed a little different then a service or parts promotion. 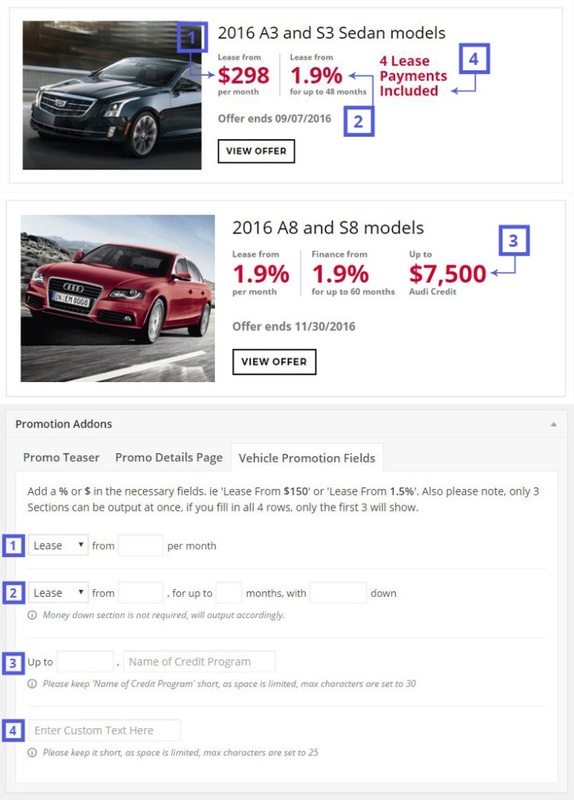 Vehicle promotions have a couple field options to choose from. Things to note, Add a % or $ in the necessary fields. ie ‘Lease From $150‘ or ‘Lease From 1.5%‘. Also please note, only 3 Sections can be output at once, if you fill in all 4 rows, only the first 3 will show. The List & Slider will only show a small excerpt of the promotional content, the promotions page (the link they go to when clicking “View Promo”) will show everything. Each Promotion details page will include a general contact form, which can be turned off under Promotion Addons, in the Promo Details Page tab.